A number of digital platforms have arisen in recent years that seek to match people who need a job done with people are willing to provide that service. These platforms represent a technological evolution tied to the ongoing labor force shift towards freelance work and independent contracting. They allow platform users to connect with a wide range of jobs with varying degrees of specialization. These might include physical tasks such as driving for ride-hailing services, simple online tasks like completing surveys, or relatively complex tasks like providing legal services. 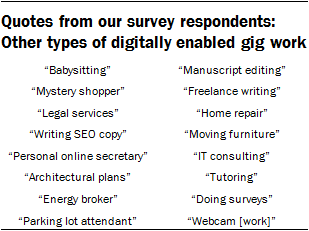 In an effort to examine this emerging mode of work, Pew Research Center conducted a survey of Americans’ experiences with digital “gig work” platforms. The Center took an expansive approach to measuring the prevalence of this type of work: Respondents were asked if they had earned money in the last year through any websites or mobile apps that connect workers directly with people who want to hire them, that require workers to create a user profile in order to find or accept work assignments, and that coordinate payments to workers once their task is complete. In addition to asking if they had earned money from this type of digital task platform, the survey also asked a series of questions about the types of jobs these users have engaged in, as well as questions about their motivations and overall experiences. In one sense, the survey finds that this type of work is relatively widespread, especially considering how new these kinds of digital platforms are. Nearly one-in-ten American adults (8%) report that they have earned money from some type of digital work platform in the last year, often by doing online tasks. Yet at the same time, these workers are extremely diverse in their motivations, their experiences and the extent to which they rely on the income they earn from these services. Many users depend heavily on these services as a key source of income and describe their motivations for using them in largely economic terms. Others use these services in a much more casual way and describe their work primarily as “something to pass the time,” rather than as a source of financial gain. In total, 8% of Americans have earned money in the last year via some sort of digital work platform. When asked about certain types of tasks they may have performed, online tasks (which might include tasks as varied as coding, data entry, taking surveys, or identifying and categorizing images) emerge as among the most common. Some 5% of all American adults report that they have earned money by performing online tasks through digital job platforms during the last year. By comparison, 2% of Americans have earned money in the last year by driving for ride-hailing services, and 1% each have earned money by shopping for or delivering household items, or by cleaning or doing laundry for someone. In addition, 2% of Americans indicate that they have done some other type of “platform work” outside of the four categories listed above. And their descriptions of these jobs highlight the wide diversity of tasks that users can take on via digital work platforms. Some described doing relatively basic tasks like moving furniture or working as a parking lot attendant. But others indicated that they use these platforms to engage in highly specialized white-collar work (a selection of these responses is included in the accompanying table). Participation in technology-enabled gig work varies by a number of factors, with age being among the most prominent. Some 16% of 18- to 29-year-olds have earned money from online gig work platforms in the last year – roughly five times the share among those ages 50 and older (3%). The median age of U.S. adults who are gig platform earners is just 32 years old. When it comes to the specific types of work that they do, young adults are especially likely to gravitate towards online task work. Fully 12% of 18- to 29-year-olds have earned money doing online tasks, but that share falls to 4% for Americans ages 30 to 49 and just 1% among those 50 and older. Along with these differences by age, platform work is also more prevalent among blacks and Latinos than among whites. Some 14% of blacks and 11% of Latinos have earned money in the last year from online gig work platforms, but just 5% of whites have done so. Blacks and Latinos are each more likely than whites to have earned money doing online tasks (7% of blacks and Latinos have done so, compared with 3% of whites). But blacks in particular are more likely than whites to have earned money doing physical tasks like working as a ride-hailing driver, or by taking on jobs involving cleaning or laundry (5% of blacks have done each of these activities in the last year, compared with 1% of whites). In addition, lower-income Americans (those with annual household incomes of $30,000 or less) are more than twice as likely to engage in technology-enabled gig work, compared with those living in households earning $75,000 per year or more. These digital platform workers occupy their time in a wide range of ways outside of task work. For instance, a substantial minority of these workers (23%) indicate that they participate in this type of work while being enrolled as either full- or part-time students. Meanwhile, some 5% indicate that they are retired from regular employment. They also describe their overall employment status in a range of ways: around two-thirds indicate that they are employed either full- (44%) or part time (24%), but around one-in-three (32%) describe themselves as being not currently employed. These workers also differ in some respects from the overall population when it comes to the financial and other types of assets they possess. Some 77% of platform earners are covered by some type of health insurance (10 points lower than the national average), while 48% have a credit card (15 points lower). And comparatively few of these platform earners are actively saving for their future retirement: 27% have a personal retirement account like an IRA or 401(k) (13 points lower than the national average) and just 8% are covered by some type of pension plan. In addition, a majority of these earners (56%) rent, rather than own, their current homes. When presented with a list of reasons why they might use digital platforms to find paid jobs or tasks, these workers cite a range of motivations. The most common (mentioned by 42% of platform earners) is simply having fun or having something to do in their spare time. Meanwhile, a comparable share (37%) says that they use these platforms because to help fill gaps or fluctuations in their other sources of income. The time flexibility that this type of work provides also ranks relatively high on users’ list of motivations: 30% say they do this type of work because they need to be able to control their own schedule due to school, child care or other obligations. And around one-in-five say that they use these services because other job opportunities in their area are limited (20%) or because they are looking to gain work experience that they can put to use in other jobs in the future (19%). Just as they have a range of motivations for doing this sort of work in the first place, platform workers assign varying levels of importance to the income they earn from these services. More than half of platform workers describe the income they earn as being either essential to meeting their basic needs (29%) or as an important component of their overall budget (27%). By contrast, 42% indicate that the income they earn is nice to have, but that they could live comfortably without it. These findings are especially notable in the context of concerns over so-called “wage theft” – workers being denied or refused payment for work they completed – in the gig economy.2 A substantial minority of platform workers (29%) say they have performed work using one of these services for which they did not receive payment. The legal status of workers who provide these services is another key policy debate involving technology-facilitated gig work. A recent Pew Research Center study of consumers who utilize shared and on-demand services found that they largely view the workers who provide these services as independent contractors, rather than workers. And when asked a similar question in this survey about how they view their own relationship with these companies, some 68% of platform earners indicate that they see themselves as independent workers who simply use these services to connect with potential customers. However, a substantial minority (26%) think of themselves as employees of the apps or services that they use to find jobs. 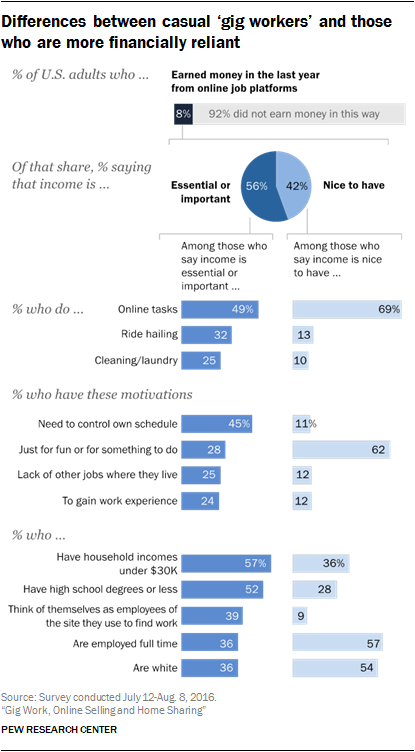 As noted earlier, more than half of platform earners describe the income they earn as “essential” or “important” to their overall financial situations, while a somewhat smaller share describe that income as “nice to have” but not particularly essential. And this division – between those who depend heavily on the money they earn and those who do not – represents a key dividing line in the world of digitally enabled gig work. These two groups differ from one another in a variety of ways: They have different demographic characteristics, gravitate towards different types of tasks and express different motivations for utilizing digital employment platforms in the first place. Demographically, financially reliant users tend to be more racially diverse and to have lower levels of household income and educational attainment. Compared with those who say that the income they earn from online gig work is merely “nice to have,” those who describe the income they earn as “important” or “essential” are more likely to have annual household incomes of less than $30,000 per year (57%) and to have high school degrees or less (52%). They also contain a higher share of non-whites and a lower share who indicate that they are employed full time. They are also much more likely to view themselves as employees of the companies or services that they use to find jobs, rather than as independent contractors who simply use these services to connect with customers. Workers who depend heavily on the income they earn from gig employment are also more likely to gravitate towards jobs involving physical labor or effort, rather than online tasks. Some 32% of these financially reliant platform workers say that they have worked for ride-hailing services, while 25% have earned money from services that involve cleaning or doing laundry – only around 10% of those who are less financially dependent on gig work income have done these sorts of tasks. In terms of their motivations, workers who depend on gig platforms as an income stream are much more likely to say that they do this type of work because they need to be able to have control over their work schedules (45% vs. 11%), because there are not many other jobs available in their area (25% vs. 12%), or because there are trying to gain experience for future job opportunities (24% vs. 12%). By the same token, they are much less likely to say that they engage in gig work for fun or for something to do: 28% of financially dependent platform workers cite this as motivation, half the share (62%) among those for whom financial considerations are less relevant.